LCD stands for Liquid Crystal Display. This is the base technology used to create the vast majority of modern flat panels. Both TFT and IPS screens are types of LCD screens. Formed from an array of tiny liquid crystals, this screen technology is used in today’s top smartphones and monitors due to rich colour reproduction and excellent performance in bright light. These screens provide excellent image quality and can be viewed in a bright light. Our LCD IPS screens are TFT LCD panels with additional IPS technology. IPS LCDs are some of the latest screens and are used in today’s smartphones. 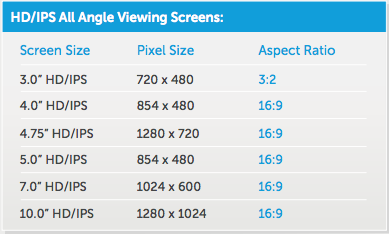 Even Apple’s high-tech Retina screen is a form of IPS screen. LCD IPS screens offer superior colour reproduction and can produce the best colour contrasts of any commercial screen panel. For a 2.4” video business cards, we use 320 x 240 digital screens with an aspect ratio of 4:3. These provide a high resolution for such a small screen and can clearly display business details, contact details, graphics and logos. What are the benefits of IPS technology? The strengths of IPS panels is that they feature deep and true blacks and can be viewed from many angles, even in bright sunlight. A group of people will be watching your video content from a variety of different angles, IPS technology ensures that every member of your target audience can clearly watch the video content without seeing any blurring effects. Therefore if you’re looking to send a video business card or a video mailer to a group target audience we recommend that you use IPS screens.